The beginning of 2016 has proven to be a busy start of the year. Fast approaching the halfway point, we are currently bringing all the knowledge we have amassed to sum up our 40 years of history. 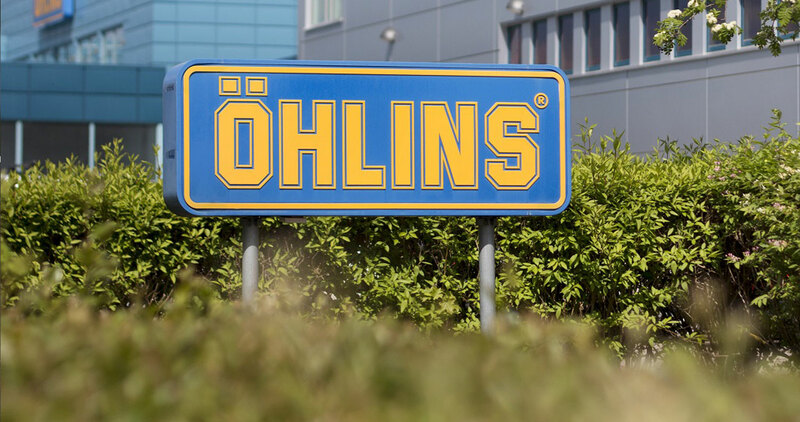 Yes, 2016 is a celebration year for Öhlins Racing as 40 years ago Kenth Öhlin built the first motocross shock absorbers which started the story for this unique company. On two wheels the year has begun very well for us. All the top teams in MotoGP run on Öhlins, backed up by our new service trailers. If you are attending a MotoGP event make sure to look out for these signature trailers, you can’t miss them! We continue to support and have success with teams and riders from MotoGP, World Superbike and National race classes from youngsters to pros such as Rossi, Marquez and Lorenzo. On four wheels we have seen another marque making their entrance into WTCC with the Volvo S60 Polestar from Cyan Racing, another car running on Öhlins renowned suspension. The reigning champion José María López is leading after four races using our renowned TTX shock absorbers. Plus the all new BMW M6 GT3 has also had an impressive start in the VLN series. 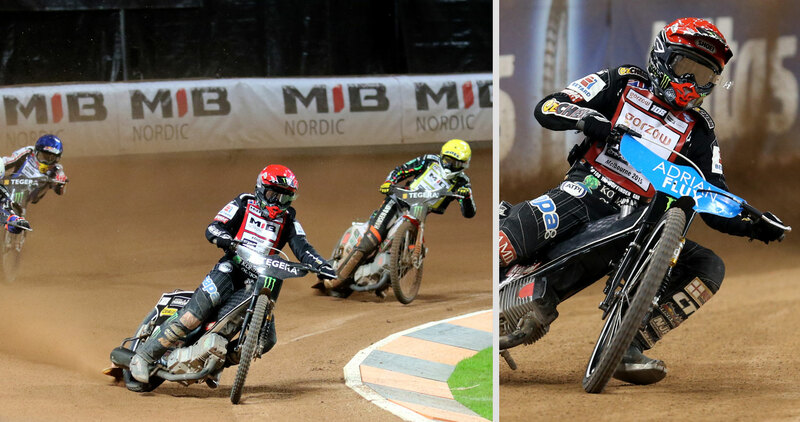 So to this edition of Performance… we have again tried to show the diversity of our world with features on the young Speedway sensation Tai Woffinden and at the other end of the age scale, seventy-seven years young (!) 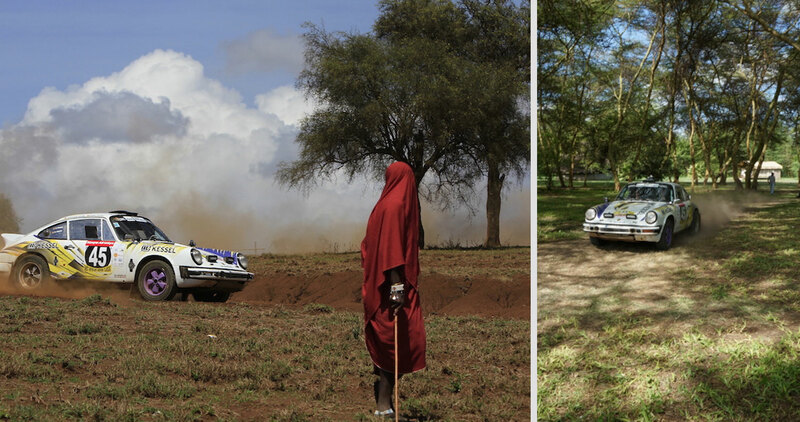 Adventurer Bernhard Kessel, racing his Porsche through the heat of the Safari Rally. Customiser extraordinaire Roland Sands tells us about his projects whilst British Superbike Champ ‘Shakey’ Byrne shows us his other ride, a one-off Harley-Davidson. We take to the trail with a top mountainbike racer and our new range of kit whilst Evo Magazine puts a BMW M3 through its paces. Yes all totally different but with one uniting factor – the chosen suspension! We hope you enjoy the read and please let us know ‘your story’! 02 – Shakey Byrne & A tale of two bikes! The dealership has had some experience in this field winning the public vote of the brand’s ‘Battle of the Kings’ bike build off. In fact alongside the new metal in the immaculate showroom is a selection of customised bikes with some subtle renditions and some less so; a full Star Wars tribute paintjob for example! So why would a racer who is attuned to 200mph, the sharpest brakes and handling go down this route? 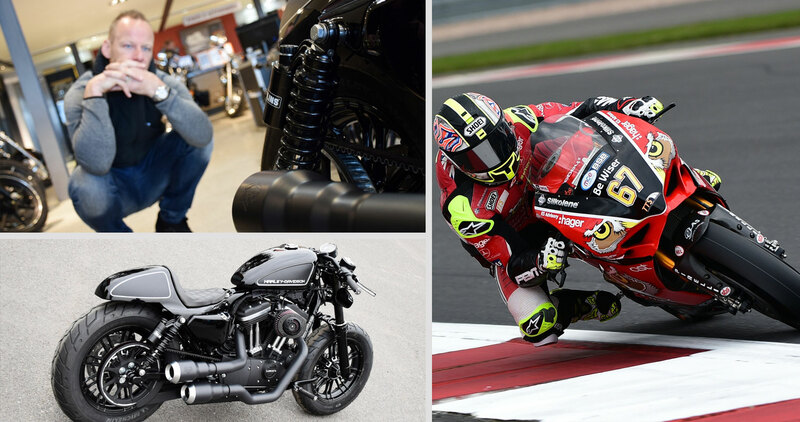 Shakey explains, “I’ve had a couple of Harley’s now and really like the whole idea of taking it a bit slower on the road these days! My last bike (the ‘67’) turned out really radical with a massive amount of changes but this bike is a lot more subtle and closer to the original. I think people are quite surprised to see a racer like me on this type of bike but the way I see it is that I spend 95% of my time on a bike under pressure, people with stop watches, being videoed and of course riders trying to get past me at every opportunity. With this sort of machine there is no reason to try and ride quickly, in fact quite the opposite, it makes me chill out, cruise along and I’ve probably never gone over 65mph on any of ‘em! I was out testing in Spain at the start of winter and needed to get somewhere, a friend let me borrow his ’48. I rode it a few miles and thought ‘this is a bit of me’ and promptly called Harry at the dealership. We started talking about customisation and I wanted it all black, so they sourced some RSD equipment and these Öhlins Blackline shocks which look the bizz and obviously offer some more comfort for cruising. 2016 sees Byrne return to Ducati after many years on Japanese machinery to try and hold off the young guns of the British Superbike Championship for an unprecedented fifth title. The exquisite Panigale machine has won at World level in WSB but hadn’t quite topped the podium in the prestigious BSB series. Shane explains, “It’s funny because when I was on Ducati’s everyone said I could only win on a V twin and I set out to prove them wrong with titles on other machines. Now I’m back in ‘red’ people are unsure how we’ll go. To be fair pre-season testing didn’t go as well as planned but what was apparent was that the base bike is spot on, it just needs the throttle and electronics matching to make it work with the BSB rules (the series runs a one-spec ECU programme to keep costs down). We haven’t really played around with the Öhlins kit much as the equipment is great straight out of the factory and the new 2016 forks are a big step up. There’s obviously millions of settings which we can start adjusting track by track but our real objective was to get the bike fuelling correctly to maximise the power first. 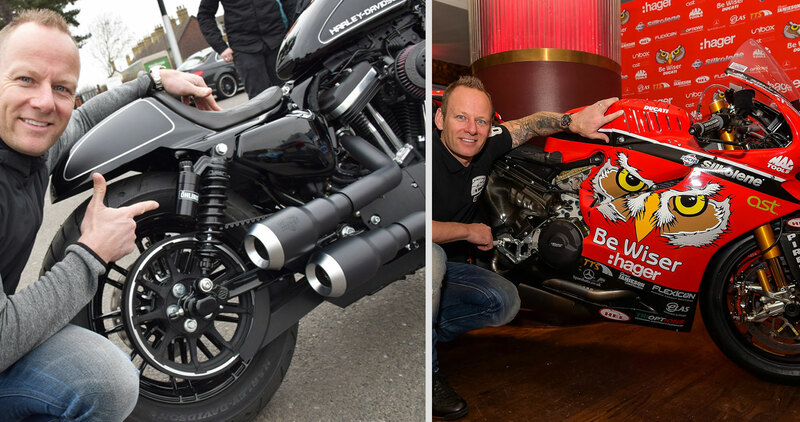 Harry Pearce, Manager of Maidstone Harley-Davidson has dealt with Byrne and commented, “Shane wanted to go for something that wasn’t too over the top but still individual enough to stand out from the crowd. Many ideas were bounced around and a lot of trial and error with the style to go for, clip on bars were the original idea but practically they weren’t quite right so we went for a set of Drag bars to keep that clean line at the top of the forks. Roland Sands Design: Fork Caps, Levers, Grips, Master Cylinder Cover, Headlight Bezel, Fuel Cap, Air Filter, Seat, Seat Unit, Footpegs, Derby Cover. 2016 – PBM Ducati… Position ?? 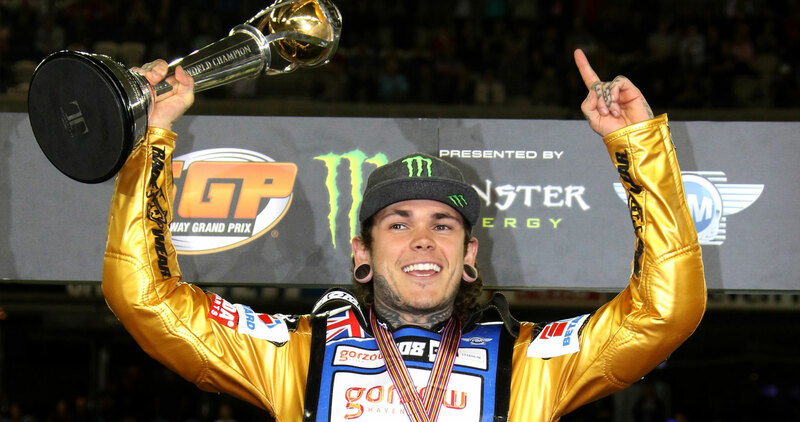 03 – Tai Woffinden… Sideways to success! Often described as one of the rawest forms of motor racing, Speedway is an incredible spectacle that sees four riders, each with a 77kg, 500cc monster (capable of surpassing the acceleration of a Formula One car) go head to head around an anti-clockwise oval. With just a throttle, clutch, one gear and no brakes they are the ultimate test of rider skill as they slide the bikes sideways into the corners for four laps per race…oh, and did we forget to mention – these incredible machines don’t have a rear shock! of Tai and his Speedway exploits from early on as I was a good friend of his father” explained Craig, “I myself had been involved in the sport from a very young age and have always been fascinated by the mechanical side of motorcycle racing. I actually began my career back in 1985 with Shawn Morwan, and worked with the likes of Bobby Schwartz, Kelley Moran, Jimmy Nilsen, Greg Hancock and then nine years with 1996 World Speedway champion Billy Hamill. After setting up a tuning company in 1997, I built engines for Billy as well as managing his racing affairs (sponsorship, contracts etc.) up until 2002, when I took a side step and began working for the Kenny Roberts MotoGP squad! I joined Kenny’s team to be part of the four-stoke engine group but was transferred into the racing team as a mechanic. I was incredibly privileged to train at HRC in Japan and build the V5 Honda that we raced in 2006. It was in 2009 that Matt Larsson approached me to work for Öhlins. I jumped at the chance and since then have worked with the brand across the British and World Superbike paddocks – although mostly I’ve been in MotoGP. It was during a race meeting watching Tai in 2010 that I decided to get involved with him. I watched him crash and I could see immediately that the problem was that his front tyre had no contact with the track surface in the corner. The kit he was using at the time didn’t seem to be working so I made him a prototype shock to test by machining an existing Öhlins part. We bolted it on for a race and Tai came straight to me afterwards to ask me to make him some more! The shock enabled Tai to take yet another step forward, as the 2013 and 2015 World Champ explains, “After trying the prototype Craig built I immediately knew I wanted this permanently, my front wheel was planted through every corner – no matter whether the track was smooth or a little rutted. After that, I’ve not wanted to use anything but Öhlins. I worked directly with Craig to develop the SW136, which I then used in 2013 in the World Speedway Championship. That was a fantastic year for me, winning the title was a dream come true and I was actually the youngest champion in the modern Speedway era too! Tai, who has a style all of his own with his tattoos and ear ‘hoops’ continues, “2014 was a bit more difficult for me, I struggled with various things and just couldn’t replicate my form from the previous year. Craig actually came on to help me towards the end of that year and we worked throughout the winter on setup which meant we were able to hit the ground running at the start of last season. It was another incredible year, perhaps my best yet, and I felt comfortable throughout the whole season. Towards the end of the year, as we began to near crunch time, things were very close at the front and my team and I decided that if I could get my head down and push to build a gap in the standings then those behind might lose track and begin fighting amongst themselves for second place. As it turned out that’s exactly what happened and I was able to wrap the title up with a round to spare! That last round was a bit of an odd experience, as I was already World Champ and if I’m honest it was one of the hardest races I’ve ever had to prepare for. Obviously there’s lots of things that need to be combined to make a World championship challenge but for me suspension is definitely one of them. I actually rode a friend’s bike last year for a bit of fun, he had a different brand on and I couldn’t believe the difference! 04 – Authentic rallying in east africa! 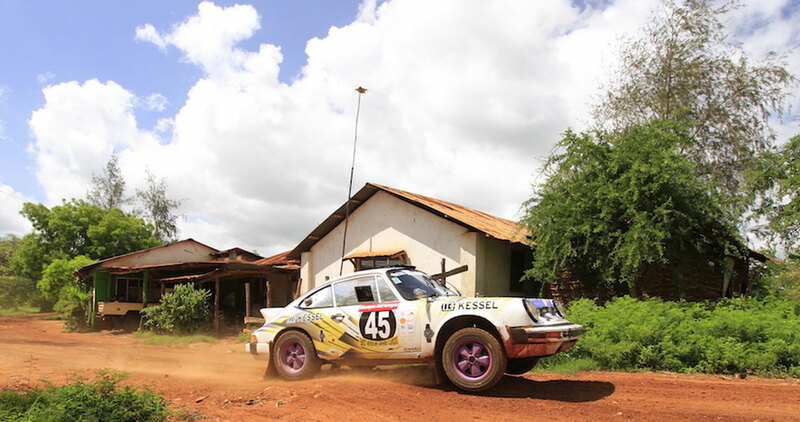 Bernhard Kessel has been a lifelong motorsport competitor and still finds the drive to leave his successful business in Germany to compete at events such as the EASC. Driving with his son Ronny as co-driver (a Porsche Sports Cup driver in his own right!) the duo love the atmosphere and sense of adventure the event retains. 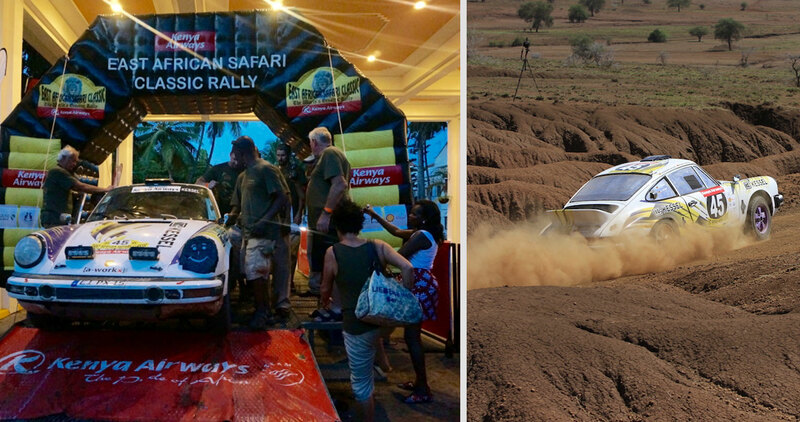 The event itself was created after the loss of the Safari Rally from the FIA World Rally Championship in 2002, when rally enthusiasts led by Mike Kirkland decided to recreate the nostalgia of “The Safari” by reverting to the unique characteristics of the East African Safari Rally. Entries restricted to classic cars built before 1974 would avoid the more powerful turbocharged and 4WD models. Rally stage sections would be longer and service support would be limited, just like in the early days. Running through the stunning and often untouched regions of Kenya and Tanzania, the event is the biggest motorsport event in East Africa. The gruelling nine day rally through the African bush was recently won by the legendary Stig Blomqvist and attracts many top competitors. Supported by renowned German performance house and Öhlins Centre a-workx this was however the Munich based firm’s first foray into the rough and tumble world of rallying. Company owner Niko Wieth explains, “Because we are well known for our work on Porsches in FIA and German GT racing, maybe we were a natural choice for Bernhard and Ronny, who also races with us in the Porsche Cup. The event was Bernhard’s third rally after a career in sports car racing and motocross. A keen motorsport collector he also owns six Audi Quattro specials including one-off Pikes Peak racers. Bernhard explains the experience of the ‘Safari’ , “This year we started well but then on day two, disaster when our engine broke. Only after the fifth day, when we got a new engine, things went good again. A-workx built our car and from the start they recommended to use Öhlins suspension. Both me and Ronny had raced solo and sidecar motocross so we knew the brand from that and car racing, so we were happy with the choice. In terms of performance and comfort we were very satisfied, it was definitely a much better driving experience than before. Engine: Custom build with unique carburetors and alloy cylinder block. At the top of the extreme customs list sits Roland Sands. A former AMA 250GP Champion, Roland retired from racing in 2002 and switched the race garage for a custom workshop. Roland and his team have built an enormous series of incredible machines over the past 14 years, including designing one of BMW’s most evocative motorcycles (the Concept 90 – which went on to become the R Nine T) and a tricked out Yamaha MT-09 which gave birth to the all-new XSR900. His latest project however, the ‘Super Hooligan’ race series, is something completely different and aims to recreate some of the earliest racing in the United States… flat tracking using modified street bikes! The idea comes from the ‘Hooligan’ scene. Dating back to the 1930s, this scene saw riders compete on lightly-modified road machines, in an almost ‘run-what-ya-brung’ demolition-derby. In more recent years, places like Ventura Raceway have been rocked by the sounds of every imaginable bike; from small dirtbikes right through to full-dress Harley-Davidson touring machines! The Super Hooligan series aims to capture that elementary nature and take it to another level. 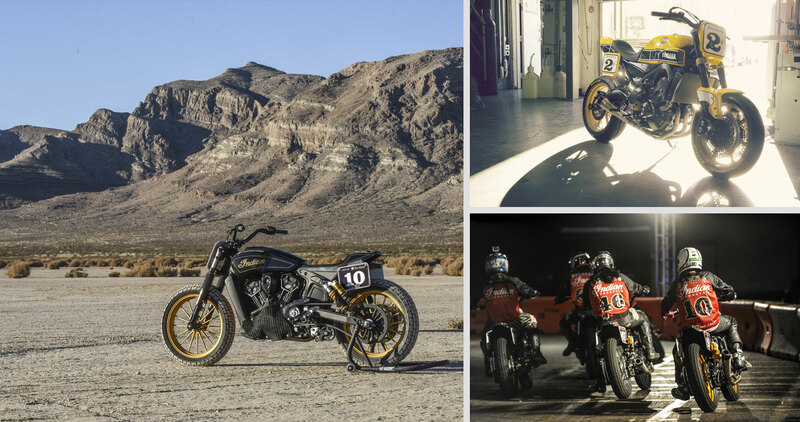 It was first launched last November in Las Vegas, during the end-of-season ‘Superprestigio of the Americas’ flat-track race meet (the exclusive event which sees the likes of Marc Marquez going shoulder-to-shoulder with the best dirt track racers from the US!). 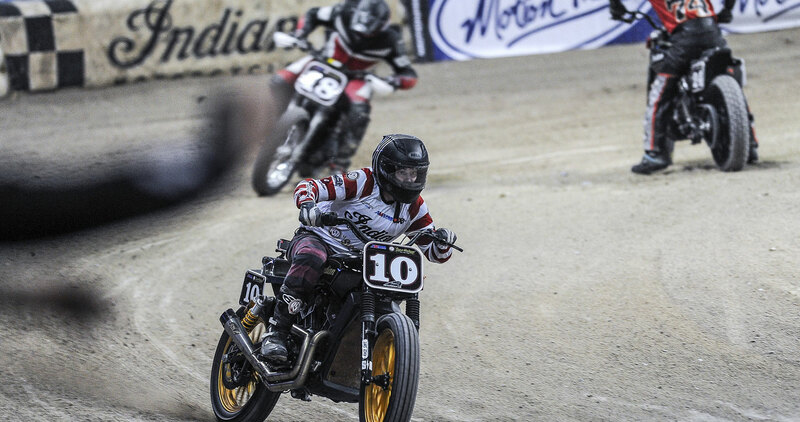 The AMAPro Flat Track organisers gave the Hooligans a slot on the bill, and the scene was set for an all-new type of racing – run as a partnership project with Indian Motorcycles and Roland Sands Design. Roland Sand Design’s Cameron Brewer, Project Manager for the build, outlines the rules… “Rules for Hooligan class bikes are definitely loose! It must be a stock-framed OEM street bike, 750cc and larger twins, triple’s, fours, etc. No “Framers” allowed. Dirt track tires or rain tires are preferred. No knobby tires. No front brakes. No sharp edges on footpegs, grips, levers. Just about everything else is allowed. The Las Vegas event was an unqualified success. 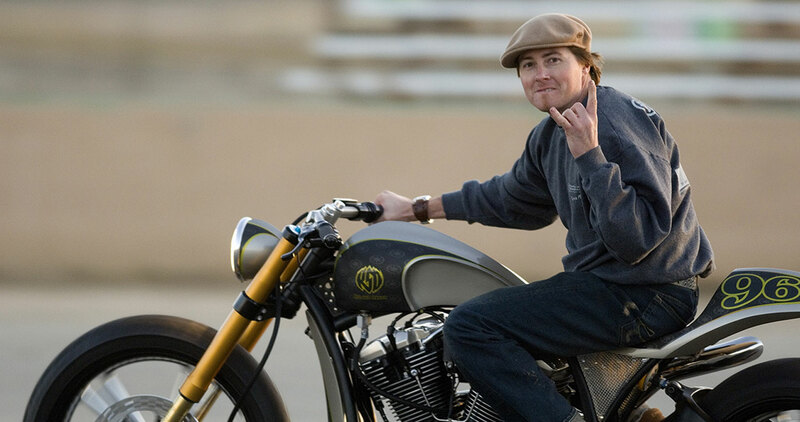 RSD built five Indian Scout Sixty Super Hooligan machines and Roland Sands himself finished the race in third, behind Thor Drake and Chris Wiggins on Harley-Davidson machines. Each of the five Indian Scouts were built to subtly different specs but a few of the machines, including Roland’s own number 10 bike, were fitted with Öhlins twin shocks. “We only had a few weeks to build these bikes for the Scout Sixty press launch” explains Cameron, “so we used off-the-shelf Öhlins 13” piggyback V-Rod shocks. The Scout shock angle and lower shock mount location (in relationship to the rear axle) is similar to a V-Rod and with the built-in adjustability, we figured we could get them to work pretty well. We went testing before Superprestigio of the Americas and were surprised at how good they worked. Spring preload changes and some clicker adjustments got them dialed in and ripping! Then in 2013, BMW signed up Sands in secret, to work on a retro-styled concept machine, that would celebrate BMW Motorrad’s 90th anniversary. The resulting Concept 90 was a beautiful machine – equipped with Öhlins suspension all round of course. The machine was then launched in a slightly toned-down form, as the RNineT. Not content with that, Sands moved on, this time to Yamaha with the firm’s MT-09 roadster. He added his usual mix of heritage, race spirit and sheer beautiful design in Kenny Roberts’ race colours, and of course, Öhlins suspension front and rear. And, like the BMW Concept 90, the Faster Wasp spawned a toned-down road bike, the XSR900. What was your first ‘non-US V-twin’ custom? My CR125 dirt bike when I was 14. It had a rad sticker kit and Acerbis bodywork with gold rims. I loved that bike. First frame-up Jap bike was a Yamaha Star with Öhlins fork and Shocks. What’s your favourite custom, the one you think is your best work? I like different bikes for different things, different uses. Purely aesthetic, I really like the Geico Chief Flat Track Bike we just did. It’s very classic but really has the high performance detailing we like. I’m very excited about the Scout Racer we’re building. It does the same thing…but I think our best work is yet to come! What was the most challenging build ever? Bikes are difficult for different reasons. 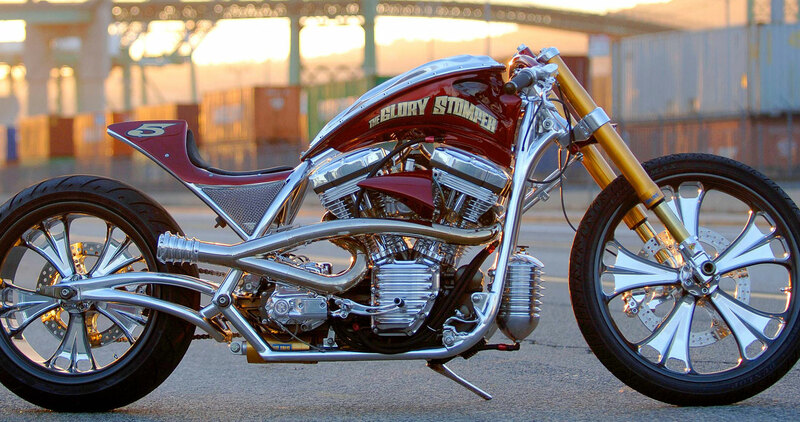 The original Discovery bike, Glory Stomper, was tough. We literally built the bike in 3 weeks from a crashed bike – Frame and everything. That sucked, I passed a kidney stone the week after we finished the bike and was in the hospital. But every build is difficult. What do you like about Öhlins parts? What type of build do they work best in? I raced and won a championship on Öhlins forks and shocks on my TZ 250 so I really trust the brand. I like using Öhlins when the budget fits, I can depend on the performance and I really like the look and attention to detail in the parts. No matter what, you add Öhlins to a bike and it speaks performance and that’s a key part of the RSD style. Which do you enjoy more: working on a one-off, totally unique, insane project, like the KRV5 Tracker – or working to develop a concept-to-production bike, like the RNineT or XSR900? What’s your favourite standard bike to ride on the street? Depends on where I’m going. Taking a quick spin with the wife I’ll jump on my 9T, or my custom Dyna Glide. If I’m hitting the road you can’t beat the BMW 1600 if you just want to roll and don’t care what you look like. S1000RR is a great canyon bike, but so is an SV650. I ride a lot of different bikes when I get the chance. What would you say is your favourite production bike in terms of design (apart from your own!)? From a pure performance aesthetic I love the Panigale right now… or at least that was the first bike I thought of anyway. 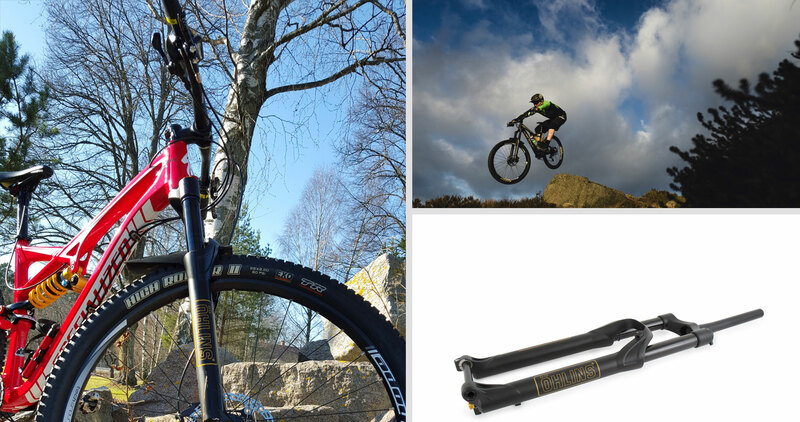 06 – Öhlins takes to the trails with new MTB Enduro Kit! The Swedish suspension connoisseurs first made headlines in mountain biking with their partnership with Specialized, as they created a cutting edge shock for the big hits of Downhill racing. The top of the range Demo8 models were adorned with yellow-springed TTX22M units as original equipment, built to withstand the massive jumps and high-speed compression that 200mm-forked DH bikes are thrown at. So the next logical step was a foray into the new and exciting genre of ‘Enduro’ — a fast growing sport that attracted riders that wished to ride fast, jump but crucially still have to ride varied terrain and climb hills. This variation obviously brought its own challenges of performance versus weight. First of all Öhlins had no history of air shocks. The STX22 was their debut and was chosen to be the OE equipment on Specialized Enduro S-Works/Expert models. The front fork was the next mission, another ‘first’ as their only MTB fork. Again a Swedish-American partnership programme was developed between the engineers at Öhlins and the R&D test team at Specialized in California. 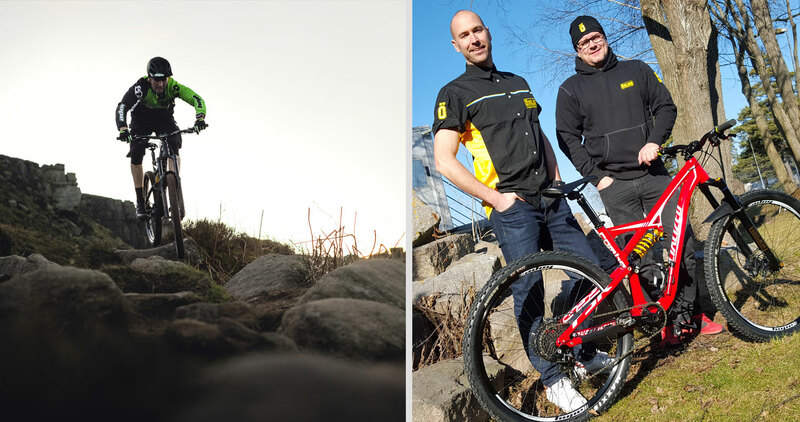 The mountain bike project team of Team leader/Technician Terje Hansen and mountain bike engineer Emil Björk take up the story Terje explained, “So after the success of the Downhill shock, Specialized approached us about creating a shock and fork for their Enduro models. The air shock worked well and they used it on the Enduro S-Works/Elite model with the large weight saving it brings over the Downhill spec spring shock we’d previously developed. So the team created the RXF34 as the first ever trail fork that utilised Öhlins’ famous TTX Twin Tube Technology — giving ultimate MTB performance yet still within the target weight. The fork was used in stealth mode in the 2015 World Enduro series with riders using unbranded, all black forks. Test teams pounded the trails of the famous Whistler complex and Specialized’s local test grounds around Santa Cruz and Morgan Hill, CA. Product Engineer Emil said: “The biggest comments we got from riders was that the forks had really nice initial ‘plushness’ giving feel and comfort but then crucially the more you push the better it functions and responds, effectively replicating the characteristics of the DH shock. It’s easy to tune and there is a massive amount of adjustment which riders of these bikes love to fiddle with! Another unique feature of the RXF is its ‘unicrown’ set-up; a one piece crown, steering tube and stem with no bearing races. Developed for maximum rigidity and for longevity, the process includes a one-piece forged unit which is then accurately CNC machined and finished. As for competition Terje explains: “The top riders in the world command huge fees so we sort of went in under the radar with unbranded products and riding in the US and Italian Nationals but it got us great feedback. We have a great relationship with Hope in the UK and their project manager Woody Hole not only tested the product but will be running it in the World Enduro series in 2016 after winning the ‘Masters’ title last season. Obviously we need to get people to try the products also, so we will be running demos at major events this year such as Crankworks Europe. Working at Hope you get used to standards and the RXF34 is a great looking, well finished, top quality fork. Once set up with the correct pressures for my weight and style of riding things felt good from the off, very stable for a 29er fork with very little flex which must be helped with the one piece crown and steerer. The 160mm of travel is ample and seems to handle all that is thrown at it whilst at the other end of the scale has the lock out for climbing which is easily adjusted whilst riding. One thing that is a nice feel is that it always feels like there is a bit left in the tank and it’s never over its travel limit! With the growing trends in off-road mountain biking it is very important to offer the complete package! So when the fork/shock combo was available it was a big thing for me. Having raced all year on the TTX coil spring I could not fault that shock but when the STX air was available it was an instant thing to move over to. With it being almost a third of the weight with all the same features it has been great to ride along with the forks making it a great all-round suspension package. For me throughout the season I will swap between the two rear shocks dependent on the type of course. We recently teamed up with Evo magazine, and their reader Mark Reeves; a keen driver, occasional track day goer and the owner of a E92 BMW M3. Mark agreed to take part in a unique test which saw his car’s standard suspension get upgraded with Öhlins Road & Track coilovers. 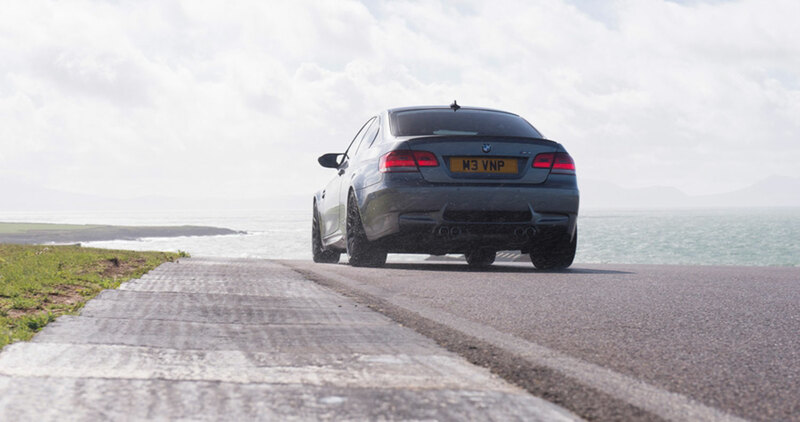 Once fitted, he would then drive to north Wales, to experience the famous Evo Triangle road-test route (one of the most demanding drivers’ roads in the country) before lapping the Anglesey Circuit to truly explore the M3’s limits by trying some extreme suspension settings recommended by our Öhlins’ experts. 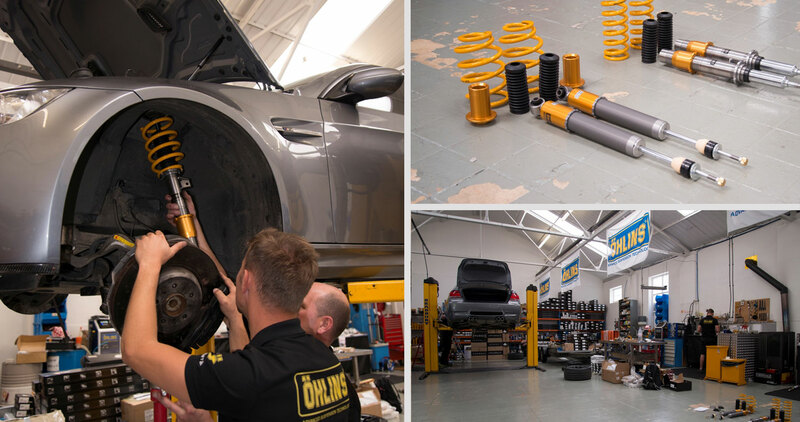 To fit the suspension, Mark was sent to authorised Öhlins distributor Mick Gardner Racing, who removed the M3’s standard suspension and replaced it with the new Öhlins Road & Track kit and complete a full geometry check. “Having been into motocross from an early age, I knew all about Öhlins’ Mark said, ‘They really have a great reputation. I stopped the bikes after I had a big accident and switched to four wheels and have had the M3 for just under a year. It’s an amazing all-rounder. It came with EDC suspension, although to be honest I only ever used to use the Comfort or Sport modes. Coming into this opportunity, I was after a slightly sharper turn-in and for the body control to be a bit tighter, but without making it too stiff. There are few finer ways to spend a day than exploring the roads of Snowdonia in a powerful, rear-wheel-drive car, as Mark found out when he headed to north Wales. The Road & Track kit offers simple, combined compression and rebound adjustment front and rear, via our unique Öhlins one-click adjuster. Mark started with a baseline setup of ten clicks front and 20 rear – a middle setting that left him with options to go firmer or softer, depending on how the M3 felt. Once he was satisfied that he had a proper feel for the first setup, he returned to make some changes before heading out again to see how it compared…and judging by the time Mark spent in his car between adjustments, it was an addictive and rewarding process! “This was the first time I had driven these roads, but they were brilliant! There really was a bit of everything, from fast open corners to tighter, twistier sections with some proper bumps and compressions. To start with I instinctively reached for the EDC button as the car felt too comfortable to work on the fast stuff, but once I’d done a few miles I realised it could up its game when it needed to. ‘We went a bit firmer with the next setup – five clicks front and ten rear – which I preferred, as it sharpened things up without harming the ride. I then tried a more extreme setting, which felt amazing through a few of the fast, smooth corners, but didn’t work anywhere near as well overall. With regular stops into the pit lane to tweak the suspension for a more extreme track-based setup, Mark was able to go faster and faster. He gradually began to carry more speed into the braking zones whilst turning in with more commitment. 03 - Tai Woffinden... Sideways to success!